The last time I had a cat that had kittens I was 7 years old or so. I don't remember much, except for that she decided to have them on my bed. It was a stilt bed, or some such thing; a bunk bed without the lower bed. But recently Jules and I found ourselves with a cat that went into heat. She had decided to pick this cat up from a local gas station. Clearly someone had abandoned it there. It was in kitty teenage-hood. A time during which the kitten stops just being cute and starts to cause havoc on their environment. We however are a super cat friendly household. We currently have 5 of them. Well how about 4.5 as we rarely see one of them. She was also a rescue. I found her and her littermates abandoned in a nearby field. Anywho.... our newest edition went into heat unexpectedly. We thought she was too young, but apparently not! Ha! She went out of heat within a day, and we suspected we had a pregnant kitty on our hands. We decided to take on the challenge of either owning all of her offspring or of finding homes for them, and decided to allow her to have her litter. 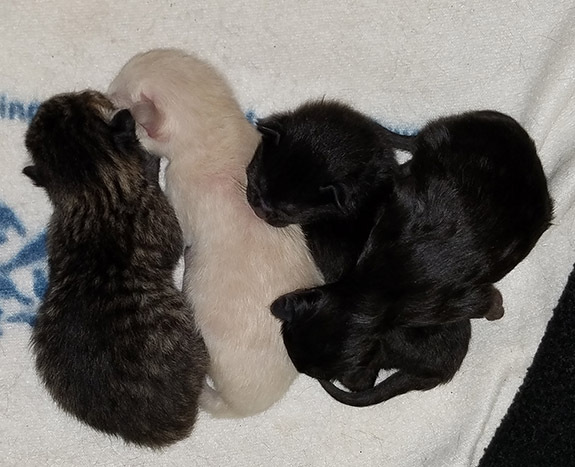 This past Monday night she finally gave birth to four healthy kitties. The mother is being a super provider and we (the grandparents!) are there to help support her. We are not sure if we are going to even try and get rid of any of them. I mean they are all so darn cute! How could we possibly let any of them go??? But that would then mean we would have 9 cats! Yikes! 9 cats! OMG! My wife keeps asking if that would make her a crazy cat lady. I suppose it would make for two crazy cat people! But come on, they are adorable! Love you, love yourself, love kittens! Right? I didn't even think of my standard ending! I rescued 5 ferral 5 week old kittens in October - it was so hard moving them to their forever homes! I got to keep two of them though and I'm so glad! They are adorable - and if you already have 5 what's another 4, right? ~Signed the bad influence! Thanks Julie! Ha-HA - "the bad influence!"